Film students often need to have fairly powerful and capable laptops in order to really excel in their chosen major. As a current major in film who wants to eventually direct 3-D animated movies, I am in a unique position to understand exactly what kind of devices are the best laptops for film students. As a student who intends to work for a company like Pixar or Dreamworks, I find that after I’m done working on my scripts, I do a lot of editing on my high definition files. This can happen inside my school’s film lab or even in my off-campus apartment, but in any situation, it’s really nice to have a good laptop for this part of the job. 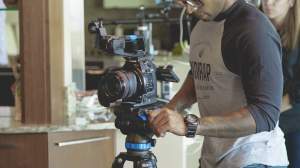 Some university film programs like the American University School of Communication have computing requirements for their film schools, so make sure that you know what type of machine you need before you start your semester. A sizeable portion of any film student’s workload will be in media playback. We tend to watch a lot of movies for inspiration and are always looking at our own work so that we can decide what needs editing or what needs to be reshot. A great laptop is the perfect for this because you can take it with your to the lab or to the set so that you can see the current work. With that in mind, your laptop should have an almost flawless level of playback capability. I tend to like a larger screen despite what this does to the laptop’s weight. Also, the resolution is one of the most important stats; many directors prefer an HD or above level of resolution. This way, you can see how the final project will look on most screens when you’re premiering it. For a standard HD resolution, look for a monitor that has a native 1920 x 1080 pixels. You might actually be familiar with this resolution as 1080p. Today, it’s becoming more and more common for our media to be in a 3840 x 2160 pixel resolution, which you may know as 4k. Personally, I think it’s better for your long term needs as a film student to seek out a 4k display because it leaves you more visual options insofar as clarity. This will vary on the student’s needs. I’ve already mentioned that I like a larger screen, especially when I’m mastering footage, but some of my friends prefer a more portable powerhouse laptop. This means that they seek a laptop that is a little lighter, maybe around four pounds or less. These are easy to carry from class to class, and as long as they have the performance, should work well for most film students. Portability is also a stat that is dependent on overall size. There are some larger laptop computers coming onto the market, so if you want one that’s more portable, shoot for one that is about 14 inches or so. These will be easy to store in a pack and use when needed. While these aren’t the features of a super computer, you won’t necessarily find these features on a $200 laptop either. It’s also important to remember that these are BASE, which means that I would recommend a setup well in excess of these requirements so that you can have a more seamless level of performance. Having said that, let’s take a look at how each component affects your experience on your laptop. When you are encoding, editing, and encrypting footage, this is where the magic happens. The simple way to think of the processor is that it’s the math center of your system. It does millions of computational processes in the time it takes for you to blink. If you plan on creating 4K or even standard HD content, then you should have a good processor that will make your film work quicker. In my opinion, the more cores your processor has, the better the experience will be. Most laptops have a maximum of four cores, which is a great place to start as these cores allow your laptop to complete multiple computations simultaneously. This means that your editing and encryption processes will be much quicker. Shoot for at least an i5 CPU, but grab an i7-6700HQ, i7-7700HQ, i7-7820HK, or even an Intel Xeon processor if you can. Many student laptops have Intel integrated graphics. While this type of laptop can work in a pinch for a film student, I recommend one that has a dedicated Intel or AMD graphical chipset. These are always better at rendering graphical content. In fact, as a digital animator, I NEED a dedicated card to run software like Autodesk Maya without any issues. When looking for a new as a film student, a Nvidia GTX 1050 graphics card or better would be your best possible choice. The amount of RAM that you have directly relates to your computer’s overall access time, so shoot for more if possible. Since most software calls for 8 GB or more, this should be your starting point. Once again, when it comes to RAM, the more you have the better. Fortunately, RAM is somewhat cheap these days, and some laptops will even let you upgrade your memory down the line. You need some place to store your footage, right? When it comes to storage, you’ll never quite have as much as you’d like, so get used to fighting for every shred of space. To make this easier, purchase a laptop that has more than a terabyte of internal space if you can. If you can’t find one like that, you’ll have to probably invest in external hard drives, key drives, and MicroSD cards to supplement your space. Also, solid-state is your friend. These drives have much quicker access times than traditional SATA HHDs, so if you can get a system with a healthy amount of space on a solid state drive, then do so; you won’t regret it. Our first laptop is a nice compromise for the price. While it won’t do an absolutely phenomenal job at film editing and encryption, it has just enough good features to be more than passable. This is fine because its $550 price tag should be in line with most film student budgets. To start, this is one of two laptops in my guide that doesn’t have a Nvidia or AMD graphics processor. It incorporates an Intel HD Graphic card into its system that is actually strong enough to be used for Autodesk Maya as per their website. While this graphical setup isn’t optimal, it should do the job. Its processor is a dual core i5-7200U, which is decent for most processes, though I wouldn’t try to use it for 4K video processing or editing. Outside of these features, the ASUS VivoBook F556UA-AB54 is a great choice for those who just need something for their film and production classes and are also on a budget. Its top features are its great display that has a good level of overall brightness and contrast. This laptop has a lot in common with our first. The processor is similarly a dual core unit (this time an i7 7500U), it has the same Intel graphics chip, and even has the same amount of solid-state storage space (250 GB). Where it differs is in its touchscreen functionality. I find touchscreen pretty useful when editing; it allows me to quickly make changes on the fly when I’m otherwise engaged. That same screen is also glare-resistant, which is rare for a touchscreen panel. For those who’ll be on-set, this is an excellent feature, especially when you consider the lighting on most film sets. Its other stats are fairly good for most film student needs and it even has a healthy battery life of nine hours. Acer clearly cut back a bit by constructing the whole thing out of plastic, but if it helps bring the price down, I get it. Now we’re in the more performant territory. This is also the point where the laptops will start to get into the more expensive range. That being said, the MSI GP62M Leopard Pro-406 has the same low storage that you get with the previous two models that I’ve covered. Fortunately, this 250 GB drive is solid-state. Fortunately, everything else is very impressive for the price range. You get a dedicated Nvidia GTX 1060 chip that’s even virtual reality-ready, a healthy 16 GB of RAM, and an i7-7700HQ processor that has a maximum frequency of 3.80 GHz and features four cores. This is another of our best laptops for film students that use the Intel quad-core i7-7700HQ processor. I personally think that this is a great laptop for film rendering, though it does have a tendency to get hot when you tax its components. This machine really shines when it comes to storage; it has more than a terabyte and a half for media storage. This storage is split up between a 500 GB solid-state unit (impressive) and a one terabyte HDD that has a speedy 7200 RPM rotational speed. For those looking to cut space and have a more portable unit, this is a 14-inch laptop, though it feels slightly larger than some of the other products out there on the market. This laptop has a display that uses In-Plane Switching or IPS, which provides some vivid visuals, though there could be refresh rate issues for content that has high frames per second. Here it is. This computer is a film student’s dream; it has a ton of editing friendly features and is even VR-ready for those times that you want to bug out between classes. In fact, this laptop was actually designed with gamers in mind, but fortunately, its powerful hardware is also very valuable for film students. Its display is an Ultra HD model, which means that you’ll be able to both edit and playback 4K video streams, which is perfect for the mastering process. Its IPS display also includes G-Sync support, which removes screen tearing effects when the GPU is taxed. The GPU itself is an Nvidia GTX 1070 that has an impressive 8GB of VRAM. Insofar as standard memory, this laptop uses 32 GB of DDR4-2133 SDRAM. Space-wise, you won’t run out easily. This laptop has a combination of a 500 GB solid-state and a traditional 2000 GB 5400 RPM drive. There’s nothing like expressing your creative process through film, but getting through film school can be tough without a great laptop. Fortunately, there is a wide range of laptops out there than can help you get through the editing and processing stages. The devices on our list are all great for your needs, but if you need additional help, toss me a comment down below, and I’ll get back to you pronto. Hi, I was wondering if there is a way you could edit hours of 4k or full hd footage on a laptop or whether a laptop can only be used to check on short video takes on location? When it come to 4k editing, because of slower render times, some people seem to recommend the top of the line mobile workstations for professional filmmaking. Is this the kind of laptop you would need to colour grade and render a movie on a laptop? ( By this, I mean something like a Lenovo p71 or Dell precision 7720 ).